there is some good news for farmers. Delhi-based National Fertilisers Limited (nfl) has started manufacturing urea coated with neem oil. Fifty field trials conducted in three states show positive results, with an average increase of 16 per cent in crop production. "On an average, 20 per cent less neem-coated urea is required as compared to ordinary urea. It is also helpful in preventing insect attacks," claims I K Suri, ex-general manager (technical) of nfl. 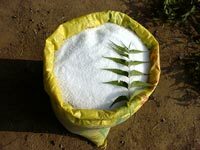 Urea is an important supplier of nitrogen, which is necessary for the development of plants. "But only 30-40 per cent of nitrogen present in the urea is utilised by crops. The rest gets degra-ded," explains Rajendra Prasad, a scientist at the Delhi-based Indian Agriculture Research Institute (iari), who developed the urea. When ordinary urea is applied, it gets converted to ammonium carbamate.Some of this gets converted to ammonia gas in what is called ammonia volatilisation. "About 8-10 per cent nitrogen is lost during volatilisation," explains C Devakumar, principal scientist, division of agrochemicals, iari. "Volatilisation is more pronounced in alkaline soils like that of India." The rest of the ammonium carbamate undergoes chemical transfor-mation and nitrates are formed. Some of these are absorbed by the plants. The rest are either leached into the underground water or are denitrified to gaseous nitrogen and nitrous oxide under anaerobic conditions (absence of oxygen). Neem has properties that check nitrogen loss at each stage. It slows down the process of nitrate formation and hence excess nitrate is not available for denitrification. At present neem-coated urea is available in Panipat. Its proponents are disappointed, as the product does not have an edge over ordinary urea in terms of cost. Both of them cost Rs 40-50 per tonne, which is just 40 paise per kilogramme. Since urea is a subsidised product, industry cannot fix its price. "This is an indigenous technology which should be promoted through financial incentives," Prasad says.